Matera is one of the oldest, continuously-inhabited cities on earth. Its historical significance and magnificent Sassi district led UNESCO to declare it a World Heritage Site in 1993. Matera has also been declared European Capital of Culture for 2019. Part of its appeal lies in the fact that humans have lived here since the Paleolithic era, in an extraordinary and unbroken chain of human connections from the dawn of mankind down to the modern era. Matera is both a modern city and a city out of time, with ancient ties to the land. Its name derives from Mater, mother, the fertile womb of life. Its honeycomb of cave dwellings are an ancient palimpsest, layer upon layer, of human life in the area. The cave dwellings, excavated out of the sheer face of the rock cliff, harken back to a primitive time, when man was at one with nature. The Sassi are an extraordinary example of the opposite of architecture – this is not a built city but a city dug out of the rock, a truly three-dimensional cityscape with endless nooks and crannies extending into the cliff face and under the dwellings themselves. The Sassi are divided into two separate districts: the Sasso Barisano and the Sasso Caveoso, with its topmost layer, the Civita, presiding over it, culminating in the splendid Apulian Romanesque Cathedral. Matera is known as “The City of Stone, of Water and of Light”. It was made famous in the 20th century by the Piedmontese writer Carlo Levi, in his book, ‘Christ Stopped at Eboli’. Over the years, a number of film directors such as Pier Paolo Pasolini and Mel Gibson have used Matera as a backdrop for their films. Tourists who find their way to this remote, mysterious, stunningly beautiful city return again and again. The city also hosts numerous sculpture shows, art exhibits, concerts and film festivals. And now, Matera is the venue of the Women’s Fiction Festival, a unique event in Europe dedicated to women’s fiction and the craft of fiction writing. What an ideal place to celebrate the ancient ties of the land and its women to the spirit of creativity! 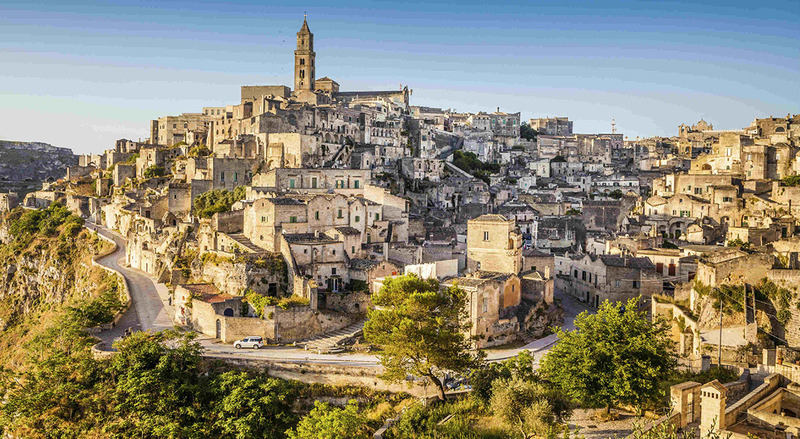 Book online your trip to Matera. Contact our partner, Agenzia Viaggi Lionetti, and reserve your room. Don’t forget to book your transfer to and from the airport of Bari Palese (€45,00). Online you can find both excellent prices and accommodation that offers you all the services you need. By train – FAL (Ferrovie Apulo-Lucane) shuttle buses from Ferrandina Scalo station to Matera (35 Km). FAL buses or trains from Bari station to Matera (60 Km). By bus – Due to the absence of national railways, bus companies propose an alternate solution. Marino connects Matera to Milan, Ancona, Bologna, Chianciano, Fiuggi, Naples, Novara, Parma, Reggio Emilia, Sassuolo, Urbino as well as to other foreign cities. Marozzi and Liscio propose links to Rome, Florence, Pisa and Siena with both day and night departures. By car – From the adriatic coast: take the motorway Bologna-Taranto down to Bari Nord. Follow the indications Altamura-Matera on road SS 99. From the tyrrhenian coast: take the Salerno – Reggio Calabria motorway and leave at the exit of Sicignano degli Alburni. Go on up to Potenza, and then up to Metaponto along road SS 407 Basentana until indications for Matera can be viewed. By plane – Bari-Palese Airport (approx. 60 Km).